If you’re looking for the epitome of what it means to offer the best of both worlds, then look no further than the 2018 Ford Escape. What we mean by that is the new Ford Escape features the power, capability and spacious interior you’d expect from an SUV, but not the efficiency and handling. That’s because the 2018 Escape handles and maneuvers like a vehicle half its size while being as fuel efficient as they come. What that all means is that the new Ford Escape has something for everyone. Need a ton of power and capability? The 2018 Escape has you covered. Don’t want to spend a ton at the pump? The 2018 Escape has you covered. Need a lot of interior passenger and cargo space? The 2018 Escape…well, you get the idea. To prove these points, let’s check out this 2018 Ford Escape versus 2018 Toyota RAV4 head-to-head model comparison. You’ll see that not even Toyota’s flagship SUV can hold a candle to the new Ford Escape. 275 lb-ft. Max Torque 172 lb-ft.
3500 lbs. Max Towing 1500 lbs. Everything we talked about in our introduction can be boiled down into one word – versatility. That’s especially true when it comes to what’s available under the hoods of the 2018 Ford Escape and the 2018 Toyota RAV4. See, the new Ford Escape gives you the choice between three impressively capable and powerful engines. In fact, the 2018 Ford Escape engine lineup can pump out a maximum of 245 horsepower and 275 pound-feet of torque. Conversely, the new Toyota RAV4 has only one available engine and it can only offer you 176 horsepower and 172 pound-feet of torque. That additional power doesn’t just mean a more enjoyable ride, either. 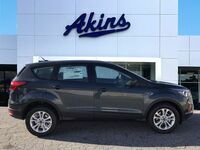 It means you’re in for a far more capable ride with your new Escape, as well. More specifically, you’re able to tow up to 3,500 pounds with your 2018 Ford Escape, whereas you’d only be able to tow up to 1,500 pounds if you went with the 2018 Toyota RAV4. As you can see, the 2018 Ford Escape is the perfect choice for anyone looking to purchase a new SUV. 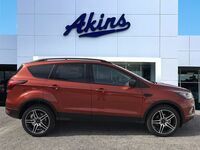 If you have any questions, please reach out to our friendly and knowledgeable Akins Ford staff near Atlanta, GA.